To hear soul-stirring music that will make your heart expand. 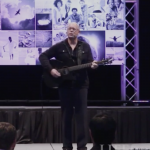 Bob Sima is a dynamic singer-songwriter, performer, storyteller, speaker and creative collaborator — often weaving all of these elements into a single performance. His soul-stirring performances straddle the worlds of folk, kirtan, soul, and gospel as he navigates audiences deeply on a journey, both individually and as a collective. Flowing with the unique energy at each event and rarely making a set-list, he is a master at going from foot-stomp to pin-drop. His performances invite a visceral embodiment of the music and message in a wide-open space of possibilities.